This page updated 15th March 2003. With many thanks to Adrian Clarke for his contributions to the history of London Country RLHs, and for his excellent photos. Introduction: the overall class history. 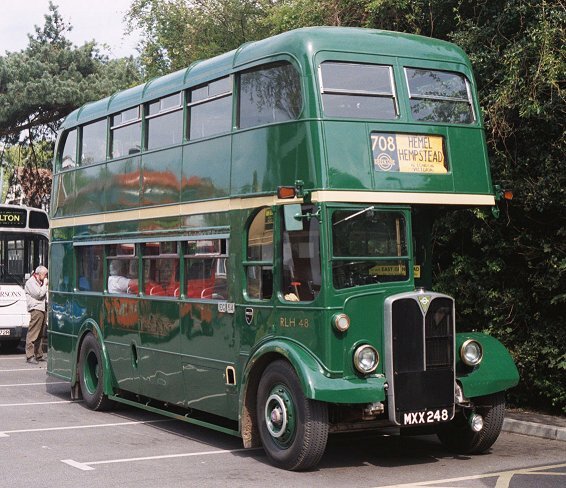 Fleet List: history of individual buses. Drawings by Ian Smith 1997, updated February 1998. Body: Weymann lowbridge: 56 seats (26 + 27). RLH1 type, with roof ventilators, and added trafficators (including RM-type indicators on the rear panel). 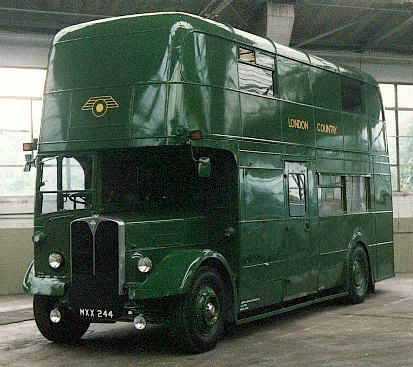 These buses had the front number-plates mounted below the chromed radiators originally, roll-up radiator blinds, and no rear-wheel discs. The route stencil holder on the rear window fell out of use early on. All were originally green, with some repainted later. RLH2 type. 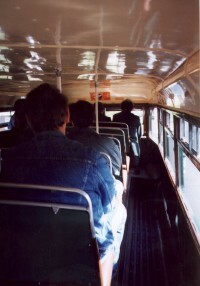 These buses had polished aluminium radiators rather than chrome. They lacked the prominent roof-mounted ventilators, but had LT-style used-ticket boxes on the platform. They also had LT double-arrow indicators above the rear number plate. RLH 21-52 were originally green (some becoming red later), with RL53-76 red. The RLH was one of London Transport's happier mistakes. Perhaps because it was not their mistake at all! 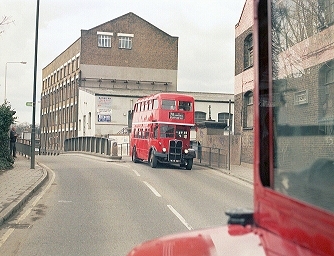 London Transport had a small but significant requirement for lowbridge double-deckers, for both Central and Country areas. Before the war it had an inherited collection of lowbridge STs (the Watford STs and Amersham STs) and STLs (the Godstone STLs), for the Country area. 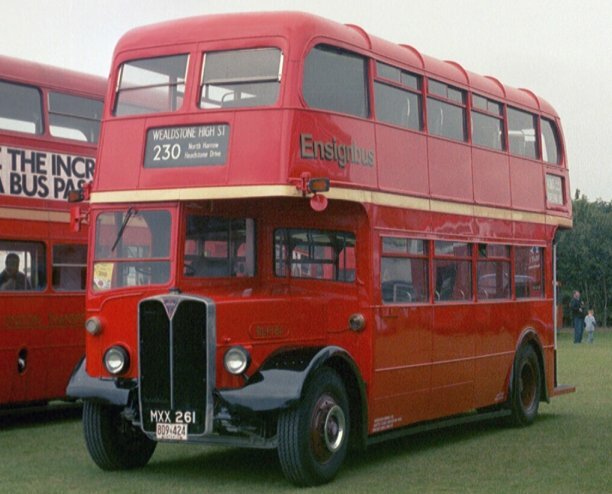 During the war some Central Area routes needed lowbridge buses too, and some semi-austerity bodies were built for STL chassis (the Chiswick lowbridge STLs). There were also some austerity lowbridge Daimlers for the Central area. These had all been kept going during and after the war, with the STs receiving diesel engines and continued heavy body maintenance. RLHs were even very occasionally pressed into Greenline service, notably during the Coronation and for occasional summer weekend extras. RLH48 has recalled this during the 2001 and 2002 East Grinstead Running Days, operating through from Hemel Hempstead to East Grinstead and back, via Central London, as route 708. But by the end of the forties there was a need to replace the entire low-bridge fleet. 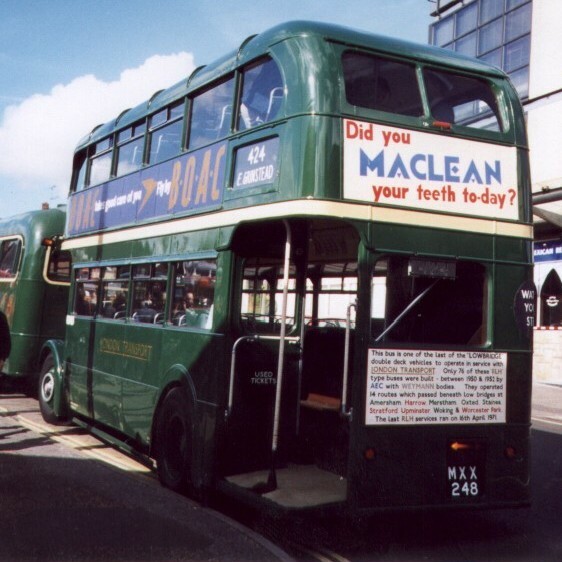 Fortunately for LT, a number of lowbridge buses became available in 1950: Midland General had ordered thirty from Weymann, but discovered that they did not need twenty of them after all! Their loss was London's gain. 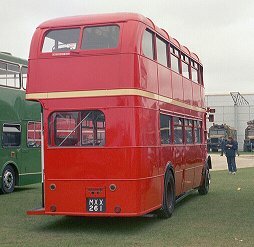 The new buses were on Regent III chassis, with a provincial body that looked much like the Weymann STLs that LT had bought just after the war, except for the RT-like rear corner - and the difference in height of course! They certainly were different from the standard RT family, with sliding ventilators, a hinged cab door, external mouldings, no rear display, and, most of all, the tall Regent III radiator. They sounded different, too. Inside, one learned not to sit on the offside downstairs - or risk bumping your head on the sunken upstairs gangway. Upstairs, the offside gangway gave access to rows of bench seats. Getting out past other passengers was an essay in tact. Six went to Godstone for the 410, to release the loaned Bristols that had enabled the Godstone STLs to be overhauled and dispersed. Six went to Amersham for the 336, allowing the lowbridge STs to be shuffled round London, displacing the austerity lowbridge Daimlers. Eight went to Addlestone for the Staines routes: 436, 436A, 461, 461A and 463. They were a success, and a further 56 were ordered to standardise the lowbridge fleet. The new buses were almost identical to the first batch, except that: they did not have prominent roof ventilators; they had polished aluminium radiators rather than chromed; they had a used ticket box on the platform and they had direction arrows on the back. (The first batch later acquired RM-type indicators at the sides of the rear platform panel. In the Country Area 32 of them replaced the remainder of the lowbridge STs and STLs, at Amersham, Godstone, Addlestone, and Guildford. Guildford received its allocation for the 436/A and 463, but used them on the 415 too. 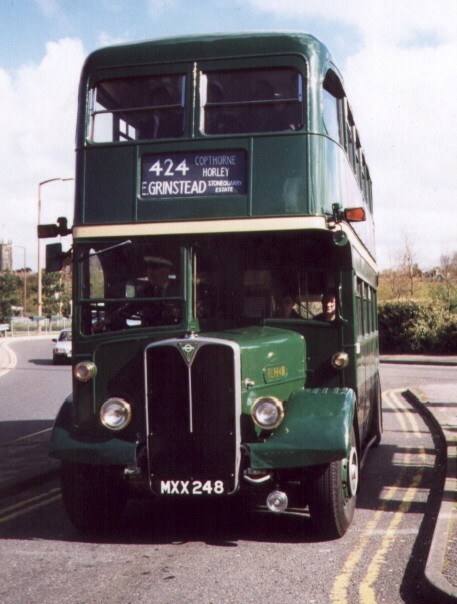 Some also went to East Grinstead for the 424 and 428, although there was no low-bridge requirement there. 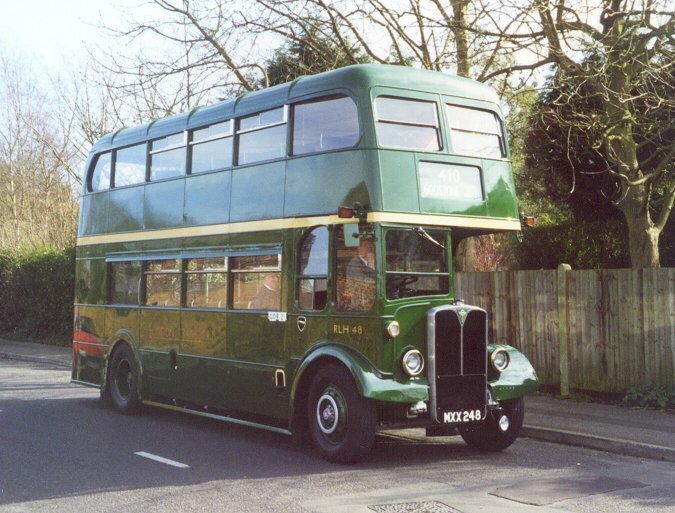 From October 1954 onwards some were allocated to Reigate for use on the 447, better known as a single-decker route for trying out odd prototypes, which had heavy peak loadings on its short workings to the Merstham estates. 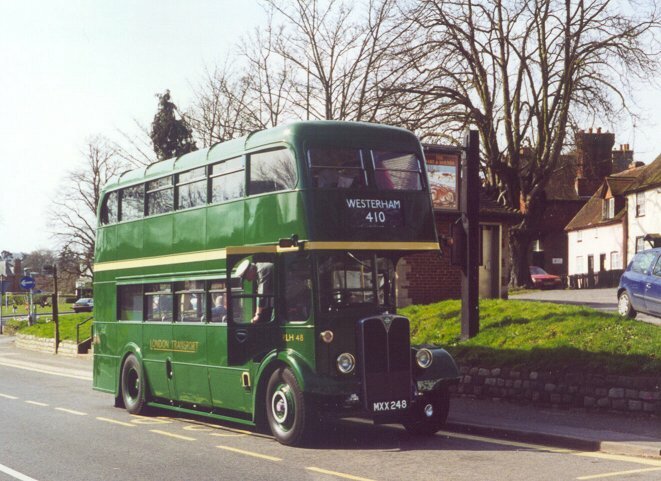 Amersham was also given an allocation for use on routes 305 and 359, previously single-decked. 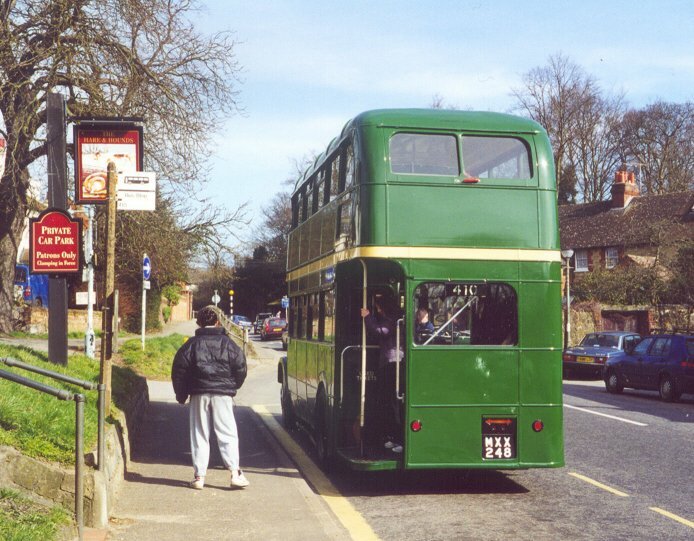 RLH48 operated on the 1998 East Grinstead Running Day in April 98. It is seen here at East Grinstead Station on a 424 journey, and at King Street. But some also went to Central Area, 14 going to Harrow Weald for the 230 and 10 to Merton for the 127, clearing the last of the non-standard lowbridge types. 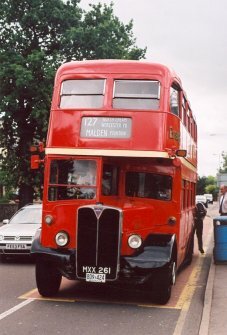 The Merton buses were also authorised to work peak services on the 152. 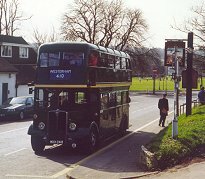 In 1955 a new lowbridge route was created near Upminster, the 248 between Hall Lane and Cranham and RLHs went to Hornchurch (RD) for this and associated duties. This caused the cessation of the East Grinstead allocation, and four green RLHs were repainted red. The 127 was a casualty of the 1958 strike, and ceased operation in August 1958. The Merton allocation of RLHs mainly went to Harrow Weald for the 230, with an equivalent number of RLHs from there going into store at Hendon, and later Finchley. In May 1959 Dalston (D) took much of the slack out of the system, when the Stratford route 178 was created, allowing lowbridge double-decker operation instead of the RF-operated 208A. Four more green RLHs were repainted red to make enough Central Area lowbridge buses, Dalston needing fourteen. Even so, Central Area continued to need to borrow green buses to cover during overhauls of the Dalston, Hornchurch and Harrow Weald allocations, bringing a touch of variety to those routes. In between times they returned the favour, and Reigate used a succesion of red RLHs on its local 447 route. The tighter requirement meant that Amersham lost its 305 and 359 workings, and Surrey the 415. Any surplus at Harrow Weald found an outlet from October 1962 on the 230A, nominally an RT route. The RLHs mostly had useful careers with London Transport, but by 1964 the lowbridge requirement was dwindling. In November 1964 the axe fell: the 410's low railway bridge at Oxted was by-passed by London Transport, and the RLHs were replaced by RTs, ending the long Godstone lowbridge tradition that had seen PS, STL, ST and loaned Bristols as well as the RLHs. (The diversion in Oxted caused so much delay and passenger frustration that the local authority discovered that it could after all lower the road under the offending railway bridge. The new direct highbridge route was later the first to receive green RMLs, in October 1965). The RLHs displaced from Godstone went into store, or replaced those at Amersham, with a couple going to Addlestone to allow their worst to retire. 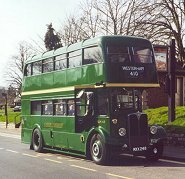 Amersham's 336, suffering reduced traffic, went over to single deck operation in October 1965, putting a stop to Watford's lowbridge history. The Amersham contingent went into store at Garston, before redistribution, mostly to Addlestone. Likewise Addlestone's 461A was single-decked in 1965. 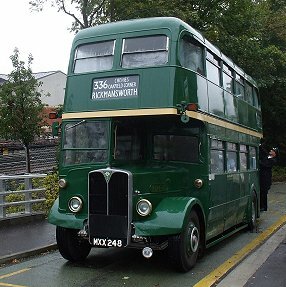 RLH48 - along with others - has revisited the 336 on Running Days, such as in October 2008. 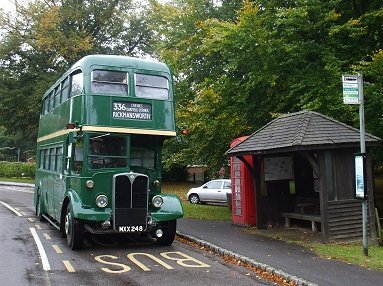 Here it is seen at the Rickmansworth Station terminus, and at Chenies. Overhauls ceased in January 1966, when there was a review of the remaining buses before the weakest were disposed of. December 1967 saw the quiet end to the RLH peak-hour duties on the 447, when RLH27 went into store. This made the 447 an all-OMO RF route, ready for the introduction of Merlins in March 1968. The 230 was the next to succumb to Merlins in June 1969, the route disappearing with the RLHs and being replaced by flat-fare H1. The eight low-height buses - including green RLH27 again- nearly all went into store at Stonebridge to await redistribution or sale. 1970 saw 17 of them transferred to London Country for continued use at Addlestone (12) and Guildford (5) , on routes 436, 436A, 461, 461A and 463. But they were to be replaced by Swifts in July that year: RLH 44 made the last journey on 31st July 1970, and the following day the last sixteen made their way to Garston for storage. RLH 44 was then selected for conversion to a mobile uniform store, and as such was seen around the London Country Area until passing into preservation. So it was the Central Area that saw the last major London lowbridge use. 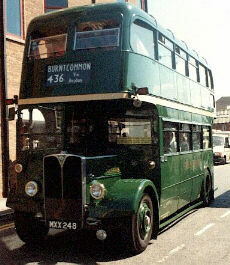 Hornchurch's 248 and 248A succumbed in September 1970, its five buses mainly going into store at Poplar. It was the 178, twisting under the maze of railway bridges around Stratford (in East London) that was the last to go, in April 1971. 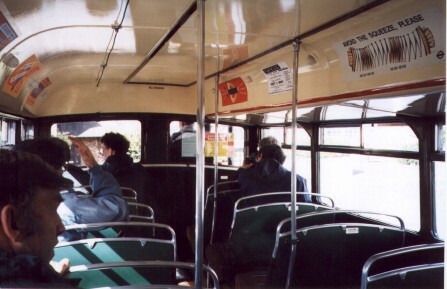 The 178 was difficult to replace, as newer buses were either too high or too long for the tortuous route, but Swifts were drafted in for a replacement route, the S3, operated by West Ham. The dozen-strong RLH allocation from Dalston, plus stored RLH72, were bundled off to store at Poplar to await their fate. RLH61, RLH23 and RLH48 returned to the 178 for a Running Day on Easter Sunday 2006. RLH61 is seen squeezing under the low bridge in Carpenters Road, while a few moments later RLH23 comes the other way over the Lea Navigation. But that was not the end of the RLH story. They were a useful, go-almost-anywhere London double-decker. As such they found ready buyers in both the traditional private bus market and in the developing world of tourist travel. 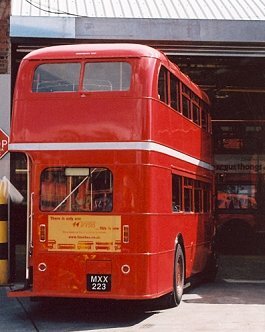 In the USA the combination of low height, which allowed conformity with local height restrictions, and a genuine red London Transport livery, was pretty well irresistable: Half the class crossed the Atlantic!. On mainland Europe too the low-height was an attraction, and three have gone to Switzerland as well as others to various countries. A few went for private use or preservation in the UK, whilst one is reported still buried in junk in a scrapyard. 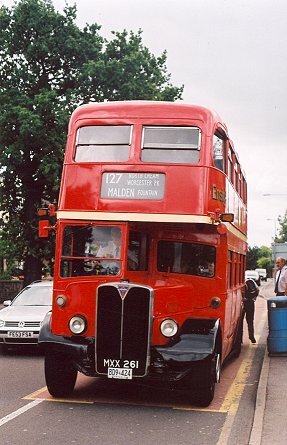 Easter Monday 1998 saw renewed RLH use in London Service: Capital Citybus hired RLH23 from Timebus to operate in some of its old haunts between Romford, Upminster and Lakeside, as route 348. 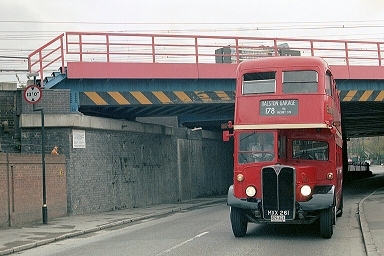 Other hired double-decker buses had to divert from the traditional route because of the low railway bridges, but not RLH23. Since then there have been other times when RLHs have been called into public duty for special occasions. 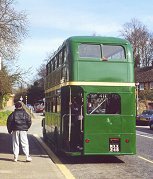 RLH48 came out to play for the day one Sunday in March 2000, joining other buses for an owners' private running day around Oxted. 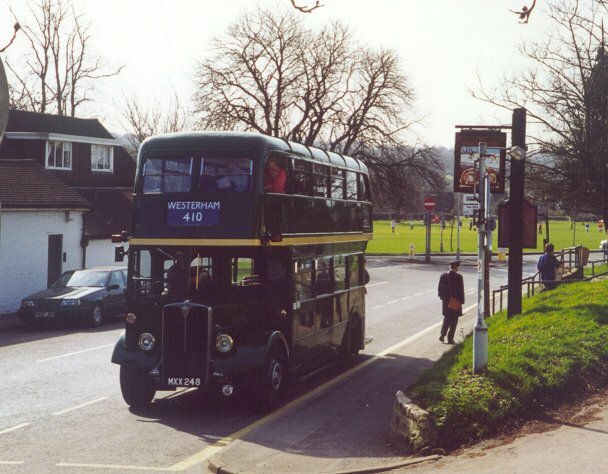 RLH48 was naturally on the 410, running between Westerham and Godstone mainly. This is not an exhaustive list of RLH routes. For instance they were occasionally seen pressed into service as GreenLine Reliefs. Not all of the routes required low-bridge buses, but RLHs operated them for operational convenience, or because there was a slight surplus of RLHs between overhaul rounds. Running Day on the 127, August 2008: RLH61 at Malden Fountain, RLH 23 in Morden Garage. Click image for larger, clearer version.